Gallipoli is a narrow, mountainous finger of land, on the western coast of the narrow Dardanelles channel, which leads from the Aegean sea up towards Istanbul, the Black Sea and Russia. It was controlled by the Ottoman Empire (now modern Turkey) , which was in alliance with Germany. In late 1914, stalemate existed in the trenches of the Western Front in Belgium and France. To break the stalemate, and to provide support to Russia, Winston Churchill, First Lord of the Admiralty, proposed a naval attack on the Dardanelles, based in part on incorrect reports about Ottoman troop strength. 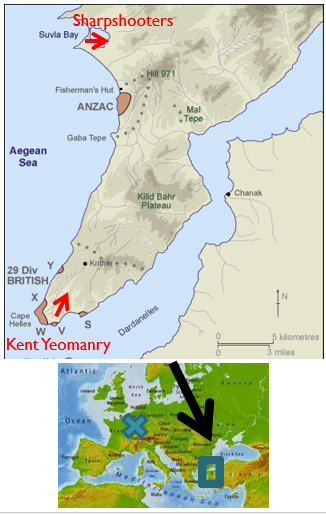 An initial British and French attempt to sail ships through the heavily mined Dardanelles failed, and the Ottomans reinforced the Gallipoli peninsula. British, French and ANZAC (Australian and New Zealand) forces then prepared a direct assault on the Gallipoli peninsula, landing on 25 April 1915.